The Dodge Coronet began production in 1965. As a full size vehicle it received the 426 Hemi engine option in 1966. However, it wasn’t until 1967 that the Coronet took on a more performance oriented purpose. The 1967 Coronet R/T was designed to be a sleek and handy performer right off the showroom floor. 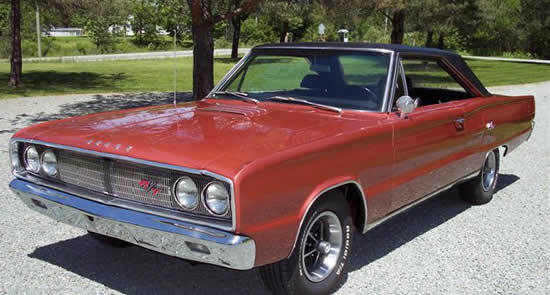 The Coronet R/T was built from the base Dodge Coronet. This vehicle featured a 117 inch wheel base and had sharp and clean body lines that ran the entire length of the vehicle. The namesake R/T stands for Road & Track was built for performance and included loads of power with a great handling package. The power came from the 440 magnum (375 hp) backed by either the indestructible four speed or 727 TorqueFlight automatic. As with other Dodge and Plymouths, all four speed 440cid and 426 Hemi cars received the Dana 60 rear end. Handling was accomplished through the use of heavy duty suspension in the front and rear of the vehicle. All cars received front disc brakes and high performance shocks. To top it off, R/T’s contacted the road with high performance Goodyear Red Streak tires. On the exterior the Coronet R/T appeared similar to any other coronet except for retractable headlights and R/T badges that were placed in the grill, on the trunk, and beside the simulated hood scoops found on each quarter panel. Coronet R/T’s were also available with body paint stripes.